When you learn how to make Ricotta cheesecake recipes you will find them to be lighter in texture and flavor than the traditional ones made with cream cheese like chocolate, pumpkin or New York Cheesecake. Most of us consider ricotta as one of the fresh Italian cheeses not realizing that it is actually not a cheese at all. If you learn how to make ricotta cheese it will help you with making cheesecakes with it. It is really a dairy food made with the leftover whey when cheese is made. This byproduct of the cheese production is not made by coagulation of the casein like cheese is but by the coagulation of the proteins which are left afterwards. Many people who are allergic to the casein in the production of cheese can eat ricotta cheesecake recipes and others without any problems with allergies. Ricotta cheesecake recipes and other cream cheese recipes can be made successfully with ricotta cheese. Learning how to cook with ricotta you will find it to be mild with a slightly sweet taste making it delicious in desserts like cheesecakes. With this mild taste any type of fruit can be added to cheesecakes giving them great flavor. It mixes well in many types of recipes like cakes making them richer in flavor and very moist. It resembles a smooth cottage cheese and can be made from cow’s or goat’s milk. Ricotta cheesecake recipes can be made by making your own at home. You can make ricotta from all types of cheese making except the soft French style goat cheese, soft molded goat cheese and Neufchatel. Those are made with drops of rennet not sufficient for ricotta. The whey must be fresh so plan to make it on the day when you make another cheese. Someone sent me these recipes many years ago so I am passing them on to you; they look easy but I have never tried them. Good luck! Place whey and fresh milk in stainless steel pot. Heat to 195F degrees, remove from heat and add lemon juice. Stir for several minutes watching as juice produces tiny curds in the liquid. Pour hot whey and curds into cheesecloth lined colander and allow to drain and cool for 25 minutes. Remove curd from cheesecloth and break into tiny pieces in a bowl. Add salt to taste and add a little cream for a richer taste; can keep in refrigerator for about 5 days. Bring the fresh milk to 185F degrees. Remove from heat and add vinegar while stirring constantly; curds will form very quickly. Pour into cheesecloth lined colander; drain for 20 minutes. Mix in salt; keeps for about 5 days. This is one of the delicious light creamy ricotta cheesecake recipes. Blending the taste of apricots makes the flavor great. You will find Italian and German cheesecake recipes similar to this one. For a thicker cheesecake use and 8 inch spring form pan instead of the ten inches. Place 2/3 cup flour on workspace; sprinkle sugar over it. Make a well in center; drop in egg and butter. Knead into a soft dough ball; press over bottom a 10 inch spring form pan. Bake in preheated oven at 400F degrees for 10 minutes; set aside to cool. Separate egg; beat white with powdered sugar until stiff and stir in egg yolk. Sift flour and cornstarch over egg/sugar mixture and mix gently. Spread mixture over baked layer and bake in oven (400F) 10 minutes; set aside to cool and remove sides. Drain apricots (from layer 4) reserving the juice and set aside. Combine in large bowl ricotta, lemon juice and sugar; blend well. In top of double boiler sprinkle gelatin over 2 tablespoons water; stir over hot water until gelatin is dissolved. Cool slightly and stir into ricotta mixture; beat whipping cream with powdered sugar until stiff. 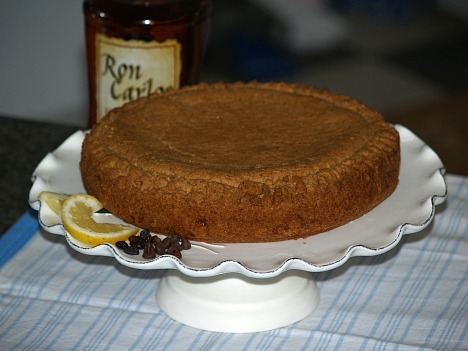 Fold whipped cream into ricotta mixture; place cake on platter and place pan sides around the cake. Spread ricotta mixture evenly over cake; remove sides of pan. 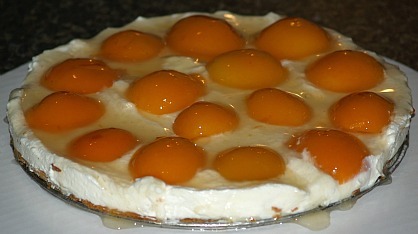 Place drained apricot halves on top of cake and refrigerate 1 hour. Measure reserved juice and add enough water to make ¾ cup liquid. Add sugar and bring mixture to a boil. Make a paste with cornstarch and 2 tablespoons water; pour and stir into boiling juice mixture. Stir constantly until mixture has thickened; boil 1 minute and remove from heat. Spoon mixture over the apricot halves making sure all fruit is glazed. Refrigerate another hour before serving. 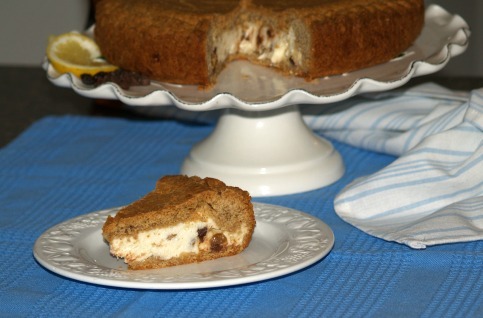 This is one of the ricotta cheesecake recipes made in a pie shell; a chocolate chip pie recipe made special with whipped cream topping. Beat ricotta until smooth in mixing bowl; beat in 1 cup sugar, salt, cinnamon, nutmeg and vanilla. Stir in chocolate chips and citron; cover and refrigerate 1 hour then scoop into baked pie shell. Whip cream until soft peaks; beat in remaining sugar and rum and swirl over pie. Ricotta cheesecake recipes vary from region to region of Italy. This one is unique from Southern Italy with the addition of many fruits, nuts and flavorings such as chocolate and rum. Heat ¼ cup sugar and 3 tablespoons of water over high heat; when sugar dissolves add pine nuts. Continue cooking swirling pan often until sugar turns a light brown. Turn pine nut mixture out on oiled baking sheet and let cool; break into small chunks. Combine raisins and rum in a small bowl and set aside for 1 hour. TO PREPARE PAN line the inside bottom and sides of 10 inch spring form pan with foil. Stir together flour, baking powder, brown sugar and almonds. Cut in butter with pastry cutter until crumbly; mix in egg and vanilla. Gather in ball (DO NOT KNEAD OR WORK DOUGH). Place a little more than half of dough on bottom of pan patting in place and pushing partway up sides. Combine ricotta, remaining 3/4 cup sugar, lemon rind, raisins and rum in a large bowl. Add chocolate pieces and pine nut brittle pieces; mix well. Spoon in ricotta filling; roll out remaining dough between two piece of parchment paper to 10 inches and lay over top of filling. Bake for 50 to 55 minutes until top browns slightly. 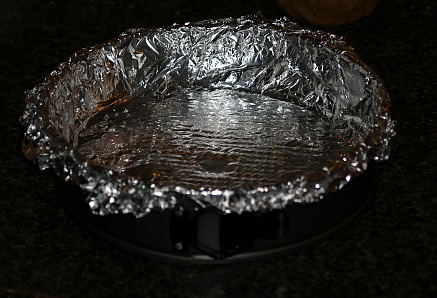 Cool cake in pan completely; remove sides and gently peel back foil from sides. Refrigerate until cold; lift bottom of ricotta cheesecake recipe with spatula and pull out the foil. Make this traditional German ricotta cheesecake recipe. Butter 11 inch spring form baking pan; sprinkle crumbs over butter. 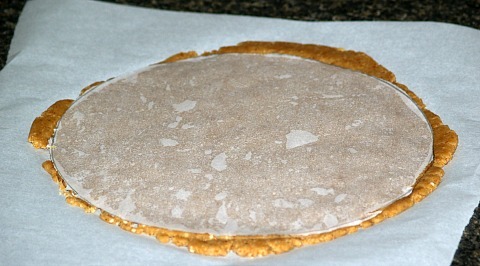 TO MAKE CRUST combine flours, salt and lemon peel; mix and make well in center. 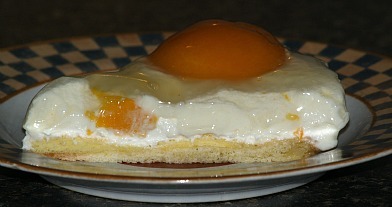 Mix together egg, yolk and honey; pour into the well of flour. Add pieces of butter; blend and knead mixture into a dough ball. Wrap ball in foil and refrigerate for 30 minutes. Press cold crust dough firmly down in pan; prick dough with fork. TO MAKE FILLING wash raisin in hot water; drain and dry. Cover raisins with the rum; cover and let stand. NOTE: You can prep the raisins earlier if you like. In large bowl beat the cheese, cream, YOLKS, honey and lemon juice until creamy. Beat in the lemon peel and vanilla; set aside. In another clean large mixing bowl beat egg WHITES and salt until stiff. Place egg whites mixture on top of cheese/yolk mixture. Add the flax meal and raisins with rum; thoroughly mix all ingredients together. Spoon this filling into the crust lined pan; bake on low shelf of oven for 1 hour. NOTE: If surface browns too quickly cover lightly with foil. Let stand until room temperature; run knife around edge to loosen. When cool place in refrigerator; chill overnight before serving. Remove sides of pan to serve; serves 16. TO MAKE CRUST combine flour, sugar, baking powder and salt in a large bowl. Beat egg yolks into sour cream; set aside. Cut butter into flour mixture until crumbly; add sour cream and yolks. Blend mixture until a dough ball forms; wrap and refrigerate 1 hour. Roll dough out and fit into bottom and 1 inch up sides of a 10 inch spring form pan. TO MAKE FILLING beat eggs and egg white on high speed until thick. Gradually add sugar beating on high speed until stiff but not dry. Pres cheese through a sieve; fold into beaten egg mixture. Add the sour cream, orange peel and vanilla; gently fold into filling. 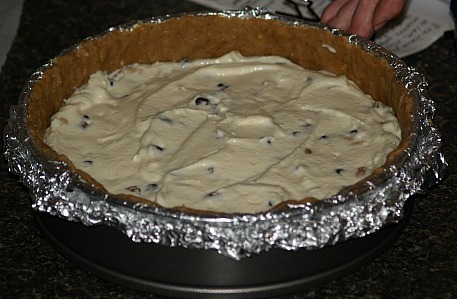 Spoon mixture into prepared dough lined pan; bake 40 minutes or until set. Cool to room temperature; refrigerate overnight before removing sides and serving.